Companies today are feeling pressure to move their business "into the cloud." At Rackspace we have a saying: "The cloud is for everyone but not everything." 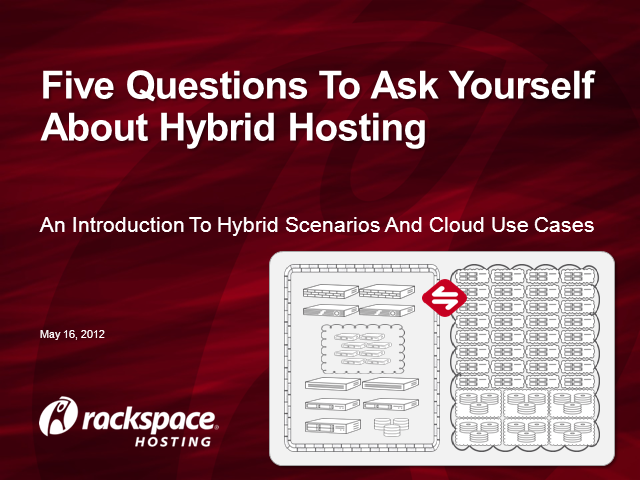 This presentation will cover differences between dedicated, cloud and hybrid hosting followed by five important questions every company should ask itself before making cloud-related moves. This presentation is conceptual and not vendor-specific; it is intended to be an overview for business decision makers and influencers and is based upon the presenter's many customer interactions with clients interested in virtualization, cloud and hybrid hosting. Paul Croteau has 20 years of I/T experience and has worked with companies including Accenture, EDS, Verizon and AT&T. He is now in his eighth year at Rackspace where he has worked extensively with customers of all sizes, most recently with a focus on enterprise businesses. Paul helped design some of the earliest hybrid solutions deployed at Rackspace including mission-critical configurations for some of the most recognized brands in the world.